Hot summer days mean starting the day off without cooking - like with these gorgeous, healthy smoothie bowls from FBC Members across the country. For more smoothie bowl ideas, check out our Smoothie Bowl Pinterest Board! 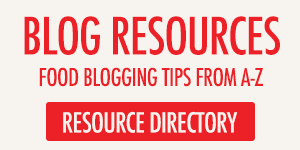 Do You Recognize These 21 Blogging Mistakes? - some good reminders here from Darren Rowse of ProBlogger on mistakes and habits that are easy to fall into - especially for the serious blogger! LittleMirandaPiggy - Miranda is a food stylist and recipe tester in Toronto so you know her food photos will be beautiful styled and they are. Check out the cinnamon pull apart loaf! Kerrie_Ahern - based out of Montreal, Kerrie's feed is a mix of simple, fresh and beautiful recipes and tasty places to eat in Montreal or on her travels. She always makes us hungry!